It is one of my top goals when writing theses blogs to be objective, un-certifiable evidence only hurts my cause. However one thing that I have learned over the years is that for every person saying one thing, there are just as many saying the opposite. Therefore I will try to limit the amount of my personal bias, and present you with only the facts. That being said The Limestone Cowboy is un-certifiable. 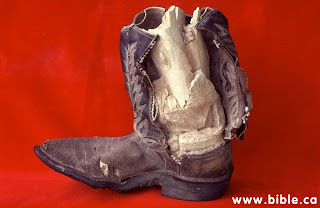 After doing some digging online I discovered that the artifact which contained a fossilized human leg in a cowboy boot. ‘According to the "Bible Probe" website, the rubber-soled boot in question was found around 1980 by Mr. Jerry Stone, an employee of Corvette Oil company, in a dry creek bed near the west Texas town of Iraan. Author Steve Keohane goes on to note that the boot was made by the M. L. Leddy boot company of San Angelo, Texas which began manufacturing boots in 1936. He explains that Gayland Leddy, nephew of the founder, recognized that the stitch pattern on the boot indicated that it was made in the early 1950's. Strict creationists Carl Baugh and Don Patton have claimed it contains a "fossilized" or "petrified" human leg inside, demonstrating that fossils do not take millions of years to form. Even if the boot actually contained a fossilized leg, it would not prove that all or even most fossils formed quickly, nor provide any anti-evolutionary evidence.’ The author of this article Glen J. Kuban is absolutely right, and absolutely biased. There is no concrete evidence that this is indeed the fossilized remains of a human, Baugh has not presented the artifact to any “evolutionary” scientist for testing. However we can not completely ignore it just because of that reason, neither should place all of our confidence in it. It is for this reason I have deemed it un-certifiable.